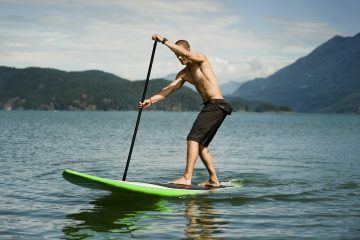 WHAT TYPE OF STAND UP PADDLE BOARD SHOULD I GET? WHAT’S THE BEST PADDLE FOR ME? HOW SHOULD I GET ON MY PADDLE BOARD? WHAT SHOULD MY STANCE LOOK LIKE? IS STAND UP PADDLING A SAFE SPORT? SHOULD I WEAR A LIFE JACKET? Did you know that stand up paddle boarding is one of the fastest growing sport in the world? 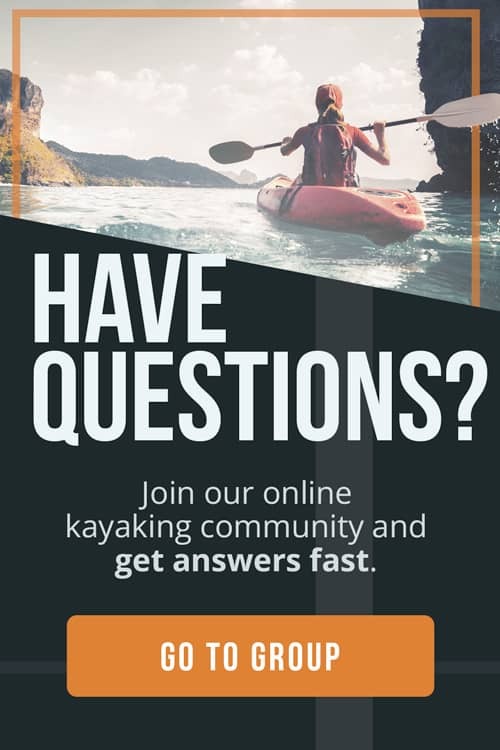 Today, thousands of people around the globe explore waterways and the sea from their board and paddle. In this guide, we’ll teach you how to stand up paddle board and include some more advanced tips for beginners. Stand up paddle boarding is a great way to build muscle, improve your balance, and see things that are only accessible to swimmers or paddlers. One of our goals here at The Adventure Junkies is to share our favorite activities with our readers. 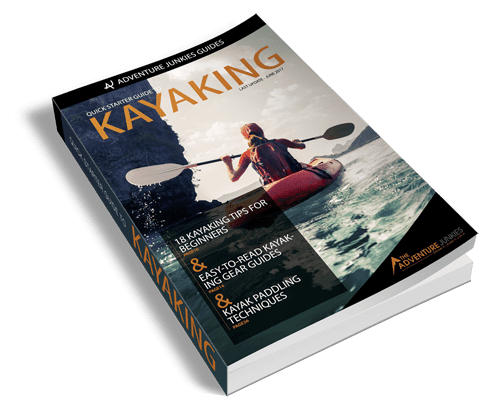 Our guide to stand up paddle boarding will include how to find the right board, how to stand and hold the paddle, proper paddling technique and more. The type of stand up paddle board that you choose is dependent on the conditions you’ll usually be in, your skill level, your budget and storage space. The great news is that there is a paddle board out there sure to be perfect for you. The best stand up paddle board for beginners tends to be wide and long. Though wider and longer boards tend to be slower to paddle, they are extremely stable and can handle choppy water quite easily. 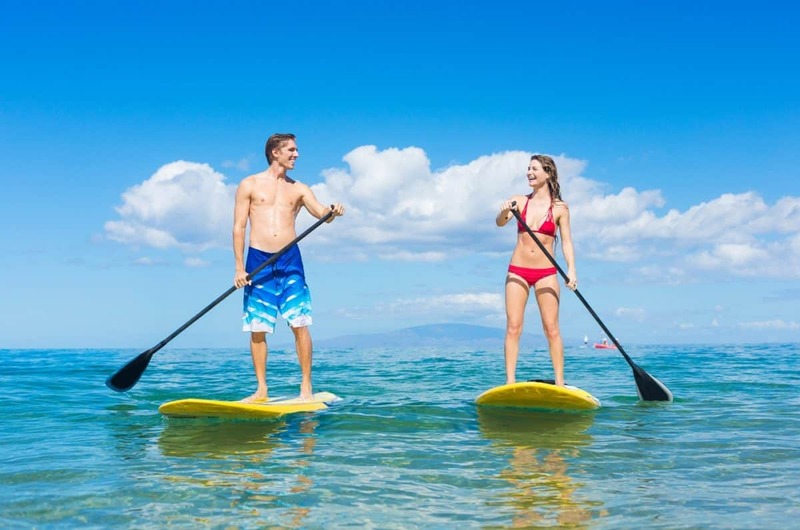 When in doubt, opt for a longer and wider stand up paddle board that is at least 10 feet long and 30 inches wide. Larger people might want to choose a paddle board that’s even bigger. If you’re limited on space (both at home and transporting your board), consider getting an inflatable stand up paddle board. These work just as well as traditional paddle boards but can roll up into the size of a sleeping bag when deflated. They also tend to be lighter and more durable than paddle boards made from epoxy and fiberglass. Isle Surf and SUP has a helpful resource chart that can narrow down the board size to match your height, weight, and skill. Not all paddle boards are shaped the same way, despite being similar lengths. 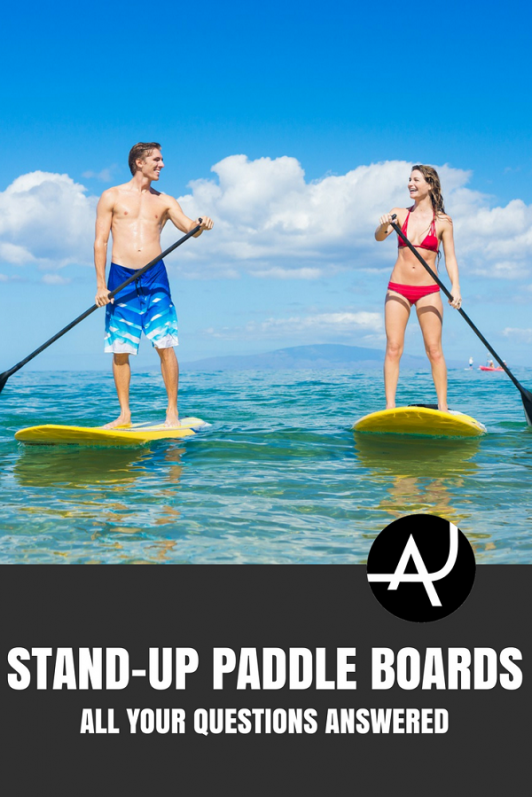 Typically, all-around stand up paddle boards are the best boards for beginners. This will let you progress from beginner to advanced on a single board. 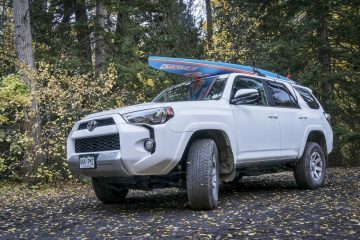 Boards created for yoga and fishing are also more stable than touring or race boards of a similar length because yoga and fishing boards tend to be wider. A narrow board is more unstable, and harder for beginners to balance on. This is why it’s essential to consider the shape and width before buying your stand up paddle board. When you’re learning how to stand up paddle board, it’s common to bump into things and fall overboard. It takes some time to figure out how to navigate and paddle without hitting the paddle against your board. 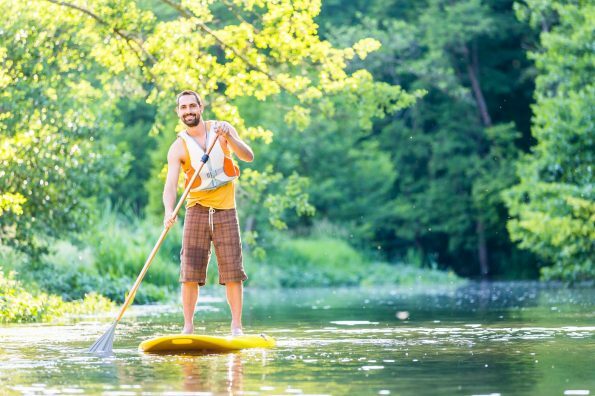 Due to this, you might want to buy a soft-top foam paddle board or durable inflatable paddle board before moving onto a paddle board made from fragile epoxy. 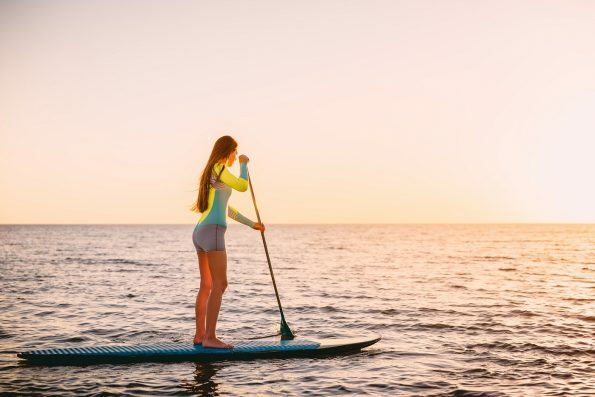 For a more in-depth look at the different paddle boards on the market, check out our guide on how to choose the best stand up paddle board. Beginners should choose a paddle that is lightweight and comfortable to grip. You’ll need to invest in a paddle that is roughly 6 to 10 inches longer than your height. Beginners should buy an adjustable paddle rather than a fixed one to find the length that works best for them. If your paddle doesn’t float, it’s worth attaching a foam floatie so that you don’t lose it when you fall. Want to learn more about how to choose a SUP paddles and see the best models of the year? Check out our guide, SUP Paddles 101. You’ll first want to walk your paddle board into knee-deep water and place your paddle near the nose (front) of the board so that it is perpendicular to the long side of the board. Then, place one knee onto the board near the handle hold. Once that’s there, you can place the other knee so that you’re now kneeling on the board in a wide, stable position. Place your hands onto the board with the paddle underneath the palms. Slowly move into a crouch while bringing your paddle up with you. For more stability, keep your knees slightly bent while straightening your back. Unlike surfing, you’ll want to stand on your board facing straight ahead rather than to the side. Your feet should be about shoulder-width apart. To adjust, slowly inch your toes forward and backward or do a tiny hop. Try not to take steps as this act will make the board unstable. Always keep your knees slightly bent for more stability and use them to absorb any chop that comes through. Stand up paddles are typically bent slightly at the blade, looking like a flat scoop. It can be counter-intuitive, but the proper way to hold a stand up paddle is to have the bend facing the rear of the board. It should not look like you are scooping the water. You might find the paddle easier to grip with a sturdy pair of paddling gloves. A stand up paddle stroke relies on your core muscles — not your arms — to maneuver. Place one arm on the handle and one on the shaft so that you form a near-perfect triangle with equal sides. Bring the paddle ahead and twist so that your paddle is buried in the water. Move the paddle back towards your feet and repeat the stroke. While stroking, keep your arms straight until the stroke is complete. You should feel your core working, not your arms. To turn, paddle solely on one side, paddle backward, or dig the paddle into the water to use it as a pivot point. The more you practice, the better you’ll get. If you feel unbalanced, try paddling faster to gain momentum and stability. Stand up paddling is a relatively safe sport as long as you paddle within your limits. Never paddle when there’s strong offshore winds, currents, or waves beyond your ability level. Always have a leash so that you can return to your board and prevent it from hitting others. When you fall, jump away from your board. Emerge from the water slowly with your arms shielding your head just in case the board has drifted above you. Everybody falls, so it’s important to practice falling safely. Always paddle in deep water away from rocks or hard surfaces. If you’re coming into shallow water, it’s best to paddle on your knees. Keep a vast distance between you and other paddlers. Remember, everyone needs room to fall and move. Sometimes, wind and chop can pick up without warning. Though it might seem more efficient to hold your standing stance and paddle against the wind, it’s actually better to lay down with the paddle underneath your chest and paddle it like a surfboard. Of course, it’s always best to paddle with a personal flotation device (PFD) as a backup — just in case you lose your board.